Buying into a building that is newly constructed offers someone a number of opportunities, one of them being the “hard hat tour.” If you have vision and imagination, purchasing a property that you have not yet seen can be thrilling. Imagine this, you walk into a sales office and are shown a floorplan; the finishes – appliances, cabinets, flooring, bathroom fixtures; and a simulated image of what your views may look like. But, until the building is substantially completed, you do not get to step inside your potential new home until after you sign the contract. While this is scary for some and may be a deal breaker, for those who are a bit more adventurous and realize the benefits of being the first to buy into a new development, this can be exciting. What are the benefits you may ask. You have first choice of exactly where you will live in the building. If you wait until it is completed, your choice will be units in the locations that remain. You get to choose some of the finishes and tailor the unit to your taste. If housing prices are going up in the market like they are now, you may get in at a lower price than if you wait until the building is completed. Buying a unit in a building that is newly constructed means that everything will be brand, spanking new and this appeals to a lot of people. Clients of mine recently bought a view condo in the new architecturally distinct Linea building at Buchanan and Market. They decided to move from the suburbs of Pleasanton and experience the city life. The Linea has sold 74 of the 100 condos that have been released. There are 115 total units in the building. Speaking with the listing agents, it sounds like a nice mix of people will be moving in – young and middle-aged professionals, former suburbanites like my clients and people looking to own a pied-a-terre in the city. 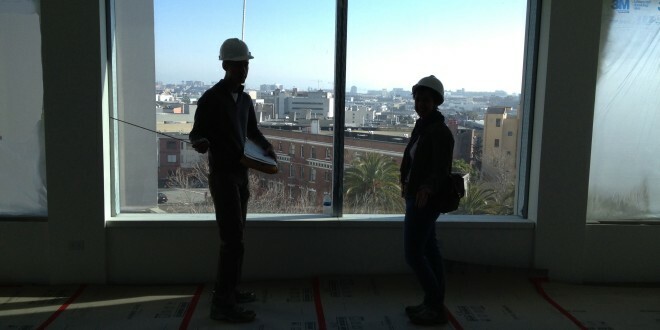 Most fun of all is the “hard hat tour”. We recently went on tour of their unit, which they were seeing for the first time. Expectations were high and they weren’t disappointed. The layout of the living area with city and some water views felt even larger than anticipated. While the bedroom was a little bit smaller than they expected, it was still large enough for their queen bed and the view was even better than they thought it would be. The bath felt spacious and the ceiling heights were good. They came out of the condo happy with their purchase and I was excited for them, too. They are looking forward to seeing the finished product and moving into the condo soon! Previous: Come See A Perfect Urban Retreat This Weekend!